​ALLEN – Construction is underway on the new STEAM center for Allen Independent School District, which will bring a new science, technology, engineering, arts and mathematics (STEAM) hub to the city. 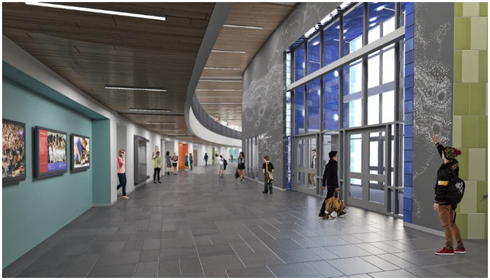 The two-story, 111,057-sf STEAM center along Ridgeview Dr. in Allen will serve as a satellite campus for Allen High School and will be used by students on field trips in grades ranging from kindergarten to eighth grade. The two different uses of the building will each have its own entrance. The center also includes a 250-seat Sci-Max theater for large educational groups, specialty labs, classrooms and collaborative learning spaces. Plans also include an outdoor learning pavilion, pond and wooded area for outdoor learning. Construction is slated for completion by late 2018.